The Macau Portuguese and English Press Association (AIPIM) has joined hands with University of Saint Joseph (USJ) to organize two training sessions on Media Law (in Portuguese) held on the 7th and 14th of July at USJ’s Ilha Verde campus from 9am to 1:30pm. The guest speakers are highly regarded lawyers Jorge Menezes and Luís Pessanha. 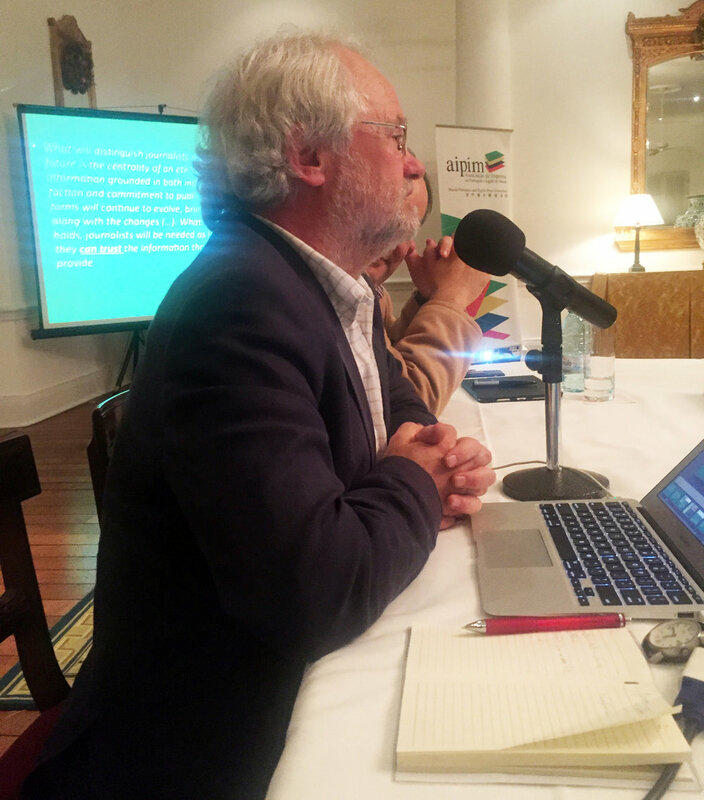 Financial Times Asia news editor Victor Mallet has shared his views and expertise with a group of over 30 journalists and citizens at a workshop held this morning, March 10, at Rui Cunha Foundation. The session was organized by the Script Road – Macau Literary Festival with the support of the Macau Portuguese and English Press Association (AIPIM). AIPIM would like to thank Victor Mallet and the organizer of the Script Road Festival. A special word of thanks to the Festival’s programme director. - A round table on Women’s Voices in the media and literature with Jodi Schneider, Isabel Lucas and Jenny Lao Phillips, March 24, 6pm, Old Courthouse. Professor Joaquim Fidalgo joined us on the 8th and 9th of December to share his expertise on ethical challenges for journalists. 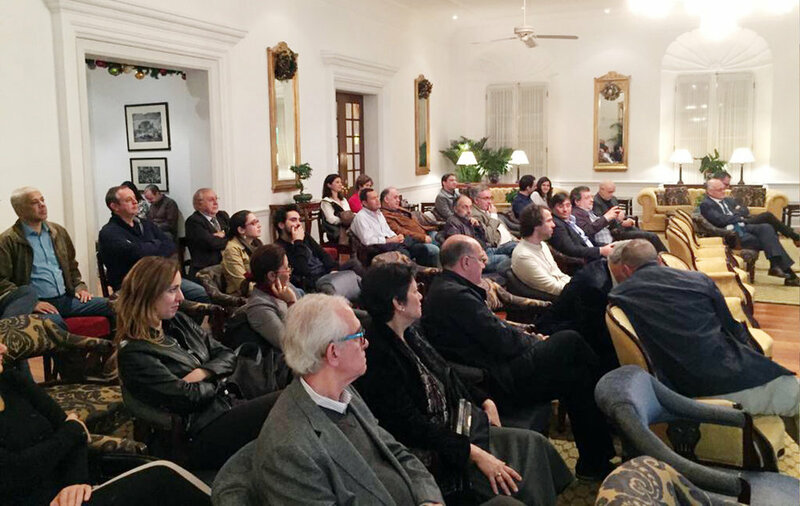 On Friday, December 8, Mr. Fidalgo, a Professor of Journalism at University of Minho (Portugal), gave an open lecture – the 5th of the AIPIM TALK SERIES - about the “Struggles on the Boundaries of Journalism”, followed by a lively Q&A session, attended by about 40 participants. On the following day, Professor Fidalgo was the guest speaker of a Workshop for journalists – as part of the AIPIM TRAINING SERIES - held at Rui Cunha Foundation and attended by 20 journalists. AIPIM would like to thank all of those who joined the events as well as those who could not make it due to personal of processional reasons but value the issues at stake. A special word, of course, for Professor Fidalgo who shared his vision with great wisdom and kindness. We believe this was an important step in a wider conversation, which encompasses not only the journalistic community but also many other stakeholders in this process. The Macau Portuguese and English Press Association (AIPIM) held a Workshop on Ethical Challenges for Journalists on November 25, at Rui Cunha Foundation, between 10am and 1pm. It was the first instalment of the newly launched AIPIM TRAINING SERIES. A total of 28 AIPIM members joined a lively and instructive session hosted by Eric Wishart, head of Agence France-Press’s Special Projects and author of the agency’s new code of ethics. It was a truly inspiring and compelling session, which focused on some of the fundamentals of our work as journalists. Eric Wishart shared his expertise and the rationale behind drafting AFP’s code of ethics before delving into controversial test cases, which prompted a lively debate. AIPIM would like to express its deepest gratitude to Eric Wishart and to those who joined the session. The next round of the AIPIM TRAINING SERIES will be held on December 9 (10am/1pm;3pm-6m) also at Rui Cunha Foundation. Portuguese scholar, educator and journalist Joaquim Fidalgo will be joining us for a session also focused on journalism ethics. The Macau Portuguese and English Press Association (AIPIM) has published on September 27 its first report on press freedom and access to sources of information (attached here) titled “Depiction of the freedom of the press and access to sources of information for working journalists”, an evaluation of a survey carried out by AIPIM among its members and journalists working for Portuguese and English media organizations. A total of 44 journalists filled in the questionnaires, accounting for almost 60 percent of the survey universe. The questionnaires were handled on a confidential basis by a third party committee comprising three experts: Frederico Rato, a well-known lawyer and veteran legal expert, José Manuel Simões, a former journalist, Assistant Professor of journalism the head of the University of Saint Joseph’s Communication & Media Department, and Rui Flores, an experienced former journalist. They were commissioned to draft a report based on the content of the questionnaires. AIPIM’s Board of Directors would like to thank all of those who participated in this very first survey and would also like to express our deepest gratitude to the independent commission in charge of drafting the report - their contribution, which was pro-bono, was priceless. The main conclusion of the survey points to a series of constraints with regards to access to sources of information. According to the report although 79% of the respondents say there is press freedom in Macau, three quarters of the surveyed journalists say they have experienced some form of restraint in their work as journalists, of political, economical, social, cultural or institutional nature, among others. Additionally, access to sources of information is commonly described as difficult. The situation is particularly serious when it comes to access to sources of information in the judicial and executive branches. With regards to the former more than two thirds (68%) deem it difficult, while concerning the latter the figure stands at 56%. Problems arise also in having access to information in the legislative branch, alongside the public administration in general. Respondents also point out a number of flaws and inadequacies within the Government spokesperson system, signalling a culture of lack of transparency. AIPIM emphasizes that “without facilitated access to sources of information, the freedom of the press can be brought into question”, in line with is spelled out in the report. In other words, right to information and transparency are absolutely necessary conditions for a truly sound and unhindered freedom of the press. AIPIM urges the Macau SAR authorities to promote a culture of transparency at the different branches of power and at the public administration at large. This survey is the first step towards a wider depiction of freedom of the press and access to sources in Macau. The next step will entail a more refined approach to better assess internal and external constraints, such as self-censorship, different types of pressure and other restraints. The Macau Portuguese and English Press Association (AIPIM) is celebrating its 12th anniversary. To commemorate such an important milestone, we are holding a special edition of AIPIM Talk Series. Our guest speaker is our founding member João Guedes, well-known and highly regarded journalist and writer who has been devoting his decades-long career to public service. He has authored a number of works on Macau’s society and the city’s idiosyncratic Contemporary History. The talk will focus on the History of Macau’s Portuguese Press. This event is organized in partnership with Clube Militar de Macau. Kindly note that the talk will be conducted in Portuguese. 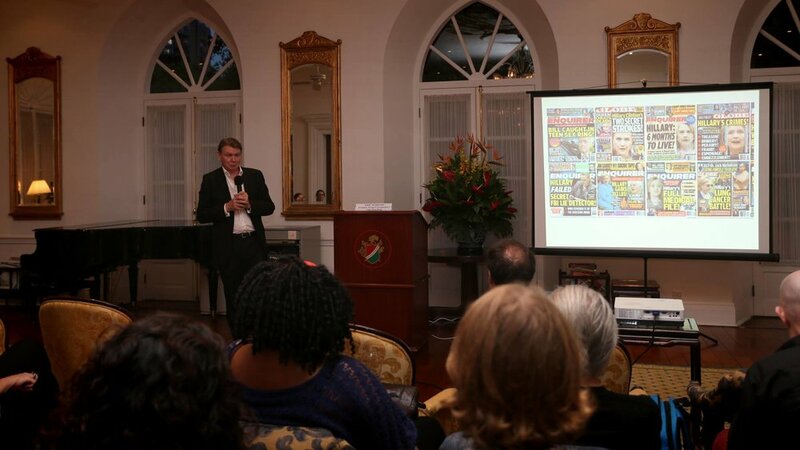 The Macau Portuguese and English Press Association (AIPIM) is honoured to have Eric Wishart, president of the Foreign Correspondents’ Club, Hong Kong, as our guest speaker. The topic of his talk is “News Judgment, Fact-Checking and Fake News”. The eventwill take place at 6:30pm, May 12, Friday, at the Military Club. Eric Wishart is a member of the global news management of Agence France-Presse and president of the Foreign Correspondents’ Club Hong Kong. He started his career back in the 1970s as a reporter in Scottish newspapers and joined AFP in Paris 1984. Since then Eric Wishart has been head of the Middle East English service (Nicosia, 1992-1996), Asia-Pacific editor (Hong Kong, 1996-1999), global editor-in-chief (Paris, 1999-2005) and Asia-Pacific director (2005-2012). He has drawn up new ethical and sourcing guidelines for AFP and has a particular interest in journalist training as he lectures part-time at Hong Kong Baptist University. The Macau Portuguese and English Association (AIPIM), in cooperation with Rui Cunha Foundation, is organising an open lecture on "Hong Kong, Macau and the future of the One Country Two Systems principle", on Thursday, March 16, at 6:30pm. The guest speaker is Sonny Lo, President of the Hong Kong Political Science Association. Location: Rui Cunha Foundation, no. 749, Avenida da Praia Grande, G/F, Macau. "The German Leadership, the Diversification of Europe, and the Future of the EU"
Freedom of expression and its limits came under the limelight in the aftermath of the terrorist attack on the newsroom of the French satiric newspaper “Charlie Hebdo”, on 7 January 2015. With the aim to discuss the role of journalists in recent times of surging terrorism, the European Union Academic Programme in Macao (EUAP-M), in partnership with the Portuguese and English Press Association (AIPIM) and the Rui Cunha Foundation, holds on 20 March 2015, from 5pm to 7:30pm, a workshop under the title “Charlie, Islamic State and the heart of journalism” by Adelino Gomes, a Portuguese journalist and university professor. The workshop is open to professional journalists based in Macau, and will be held at the Rui Cunha Foundation. It will be conducted in Portuguese with simultaneous interpretation into Cantonese. Theme: "Workshop on European Union for the Macao Journalists"
Time: 3:00 – 5:30 p.m.